William Shakespeare was an English poet and playwright, widely regarded as the greatest writer in the English language and the world's pre-eminent dramatist. He is often called England's national poet and the "Bard of Avon" (or simply "The Bard"). His surviving works consist of 38 plays, 154 sonnets, two long narrative poems, and several other poems. His plays have been translated into every major living language, and are performed more often than those of any other playwright. Thought I'd offer something away from the popular culture today. So I present to you William Shakespeare, reputedly the world's greatest English playwwright! joe, this is so cool. i think shakespeare is my fave so far! I am impressed with the diversity of your choices for models. You have a devious mind. You got to do William Faulkner, please. Great project idea. As an Eng. Lit. student, I think I'll have to make Shakespeare first. He can sit on my computer at Uni and (hopefully) inspire me. For something more lowbrow, how about Sylar from the Heroes TV show? Christopher Walken, holding a cowbell. Sorry,Ampharos64 but "Lost" before any other show,right Joe? He looks great for a dead guy. Thanks everyone! I had lots of fun doing this and I try to cover a diversed range of characters so that everyone can have something he or she likes. LOVE this one! NEEED to download it!! This is fantastic! Thanks! I've printed this out to make tomorrow. I've also linked to this on my Shakespeare for Children lens. Could you make the Squidoo squid as a model? I know that all of us lensmasters at Squidoo would LOVE it! eeek!! 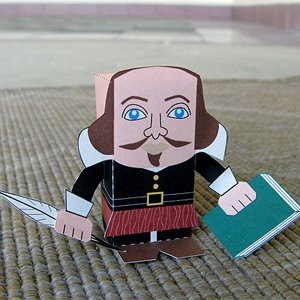 So delighted to come across this on Pintrest and discover your site =) I will be making these with my Lit class next semester when i introduce Shakespeare along with the paper toy of the Globe theatre I found. Thank-You!